Transcribe audio to text in over 150 languages with the leading online transcription company. Are you looking for professional transcription services? Do you need to transcribe audio to text? Perhaps a film, a telephone call, or an interview? Espresso Translations offers a vast array of quality multi-language transcription services to meet all of your needs. 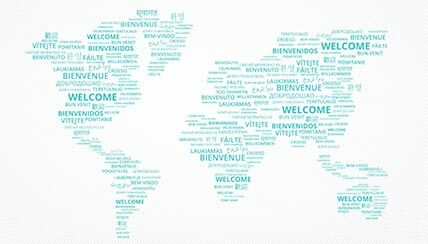 We provide both same-language and multilingual transcripts in over 150 different languages, covering many dialects and accents. Whether it be a same-language transcription, audio transcription and translation services, or even subtitles in a time coded format, look no further. As an ISO certified translation company, you can rest assured our transcribing solutions are of the highest quality. With our express solutions, we can have your accurately transcribed audio files back to you within a matter of hours. Same-language transcripts involve listening to a recording and typing up the contents into a digital written format. They are often required by professionals such as doctors, lawyers and lecturers who need certified written copies of discussions available for reference. Multilingual transcription services involve transcribing a recording directly into another language. Translation allows your audio media to be understood by a foreign audience even when it wasn't originally recorded in their native mother tongue. This involves transcribing audio content into its original language before then translating it into a second language. The layout of the transcript is in two columns so that the reader can understand which part of the original the translation corresponds to. This involves producing either same or foreign language transcripts in a time coded format that can be used in post-production for clips or films. Subtitling benefits the deaf, hard-of-hearing or foreign viewers who are unable to understand the original. The professional transcription services we offer are a testament to our understanding of the diverse needs of modern businesses in a technological world. Whether it’s audio recordings or video clips you wish to transcribe, our experienced transcribers can quickly deliver the text version of your content in either its original language or translated into a foreign language. Transcription is an art. It involves so much more than listening to recordings and just writing down what you think you hear. It’s about researching a topic to ensure that it’s understood in its entirety, checking that names, places, and acronyms are correct, not to mention the importance of spelling and grammar. In choosing us as your audio transcription services partner, you can rest assured that your project will be completed by a native-speaking translator who has at least 5 years’ experience in the industry before being checked by a second translator, guaranteeing accuracy and reliability. Alongside speech, our linguists are also experts in technology, meaning we can deliver your transcripts in the exact media types or file formats you require. Every audio video sound is transcribed verbatim exactly as it is heard including natural pauses, laughter and emotion. Irrelevant words such as 'ah' and 'oh' are omitted, as are emotions and half-sentences. Some light editing is used. Heavily edited for readability and clarity. Often used for more formal purposes or as a basis for translation. Subtitling services for films using time coding software. Saved in specific file formats ready for post-production. WHY TRANSCRIBE AUDIO INTO ANOTHER LANGUAGE? Translating your video audio into a foreign language unlocks the potential of your work to an international audience. A quality translated transcription will allow your target audience to engage with your content across different media to achieve maximum visibility in overseas markets. If your film or marketing project involves working with dialogue in another language, our script transcriptions can give you the adaptability you need to communicate your ideas on an international stage. As with all of our quality transcription services, your project will be carried out from start to finish by carefully selected native translators, so you can be sure that your transcript translation will have the living feel and natural flow of everyday speech. Central to the quality transcription translation we offer is an awareness that the dynamic of exchange and international communication is never simply one-way. For more complex documents and texts that may originate in more than one language, or need to be translated into several, our multilingual transcription services allow for us to work with the versatility of your target market. So, if you’re looking for either same-language or multi-language research transcription service, interview transcription, a video translator, or voice over services, contact us now with the details of your transcripts, and we will get back to you with a competitive quote within the hour. Our multi-lingual transcription and translation services involve transcribing the original audio or video file either directly into the target language or first into the original language followed by into the foreign language. Learn more about our professional translation services or give us a call today. With over 500 expert human transcriptionists specialising in different fields, we guarantee a highly-accurate transcription service while maintaining an incredibly affordable price. The same can be said if you decide to further your project with translation. We can work from a number of different formats and file types so if you need to translate transcripts to English or speech to text, Espresso Translations can help. To ensure the highest level of accuracy, we tend to prefer double-column transcriptions. With this method, a same-language transcription is completed by a native speaker of the original language, before being passed to a native speaker of the foreign language. The translator then completes the next step, ensuring that the translated transcript is accurate and natural and that the vocabulary used is localised. We have in-house tech-experts, meaning we can complete transcriptions from, and deliver in, a vast array of digital file formats. We can handle both single and multi-speaker projects, and we deliver the transcript back to you in an easily-understandable script style. At your request, we can also use time-coding software so that you can identify the exact moment speech or a phrase is being said and by who. WHAT TYPES OF FILES DO YOUR TRANSCRIPTIONISTS SUPPORT? We are well aware that detail and precision are two of the most powerful tools of any language, and so our friendly team will endeavour to protect the finer elements of your transcripts while maintaining affordable pricing. Once audio content or media has been transcribed into the original language, we can then translate it into one or many languages and formats to allow your content to reach an increasingly wide audience. We understand that while sometimes the video transcription content will need to be used directly as you receive it, there are also times when you will want to work with the transcribed content as a starting point for further development or translation. All of our transcriptionists have excellent word-processing skills and meticulous attention to detail. They can handle both live and recorded audio and video files. Whether you need a website, voice, academic, podcast, research or legal transcription, or something else entirely, complete our online form to find out about our best transcription services rates. We also offer faster, same-day turnaround times for those more urgent projects. Looking for the best transcription service around you? Look no further. Espresso Translations is a highly-reviewed language service provider. We are one of the top urgent transcription companies in the UK. Find out what our clients think by reading our customer reviews on Google.